CARBON COPIES on CLIMATE CHANGE: Kathleen Wynne (L) – Patrick Brown (PC) – Andrea Horwath (NDP); “NO THANKS…” says FP candidate Doug Thom to Ontario’s beer monopoly; THE TAXING REALITIES OF CARBONATED POLITICS – by Robert Metz; HUDAK PCs COMMITTED TO ‘FIGHT CLIMATE CHANGE’ VIA CAP AND TRADE – Paul McKeever (from the FPO Archive – June 3, 2011); “MONOPOLY UBER ALLES”; DECISION ON COMPLAINT RENDERED. 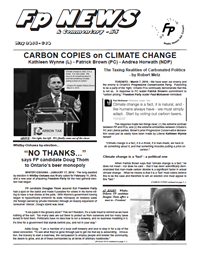 NOTE: Hard copies of this issue of FP News and Commentary were mailed to Freedom Party members and supporters together with a cover letter written by Freedom Party of Ontario president Robert Metz. A link to the cover letter is provided below.